Copper is considered a mineral of energy and mental agility. In legend, copper is said to be the metal of the God Hermes, who facilitates mental agility, and quick wit. 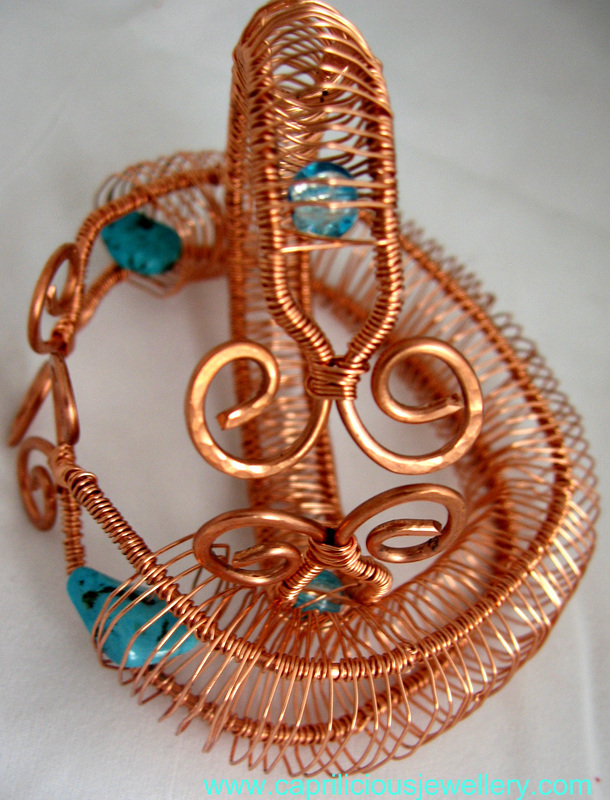 Copper is an excellent conductor of energy, from electricity to the mystical subtle energies emanating from higher planes, etc. 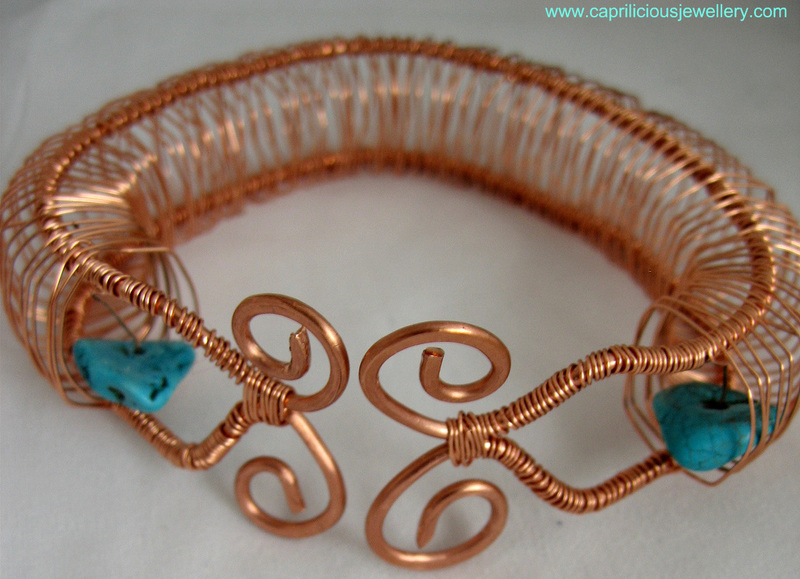 Thus, copper is said to enhance and transmit thoughts, even over long distances. 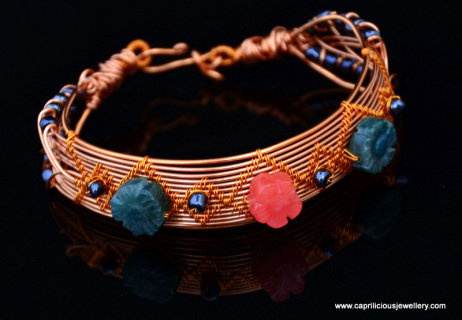 Physically, copper is used in traditional folk remedy and crystal healing lore to bring in additional energies for all types of healing, treatment of arthritis, relieving the pain of broken bones, and low energy. It is also thought to increase the effect of gemstone healing. If you believe in the magical mystical medicinal powers of copper these are for you - if you dont, have a look anyway, they are pretty! The bracelets have been combined with beads and gemstones to enhance their beauty as well as increase their mystical properties. For non believers as well as those who swear by their copper and gemstone lore. 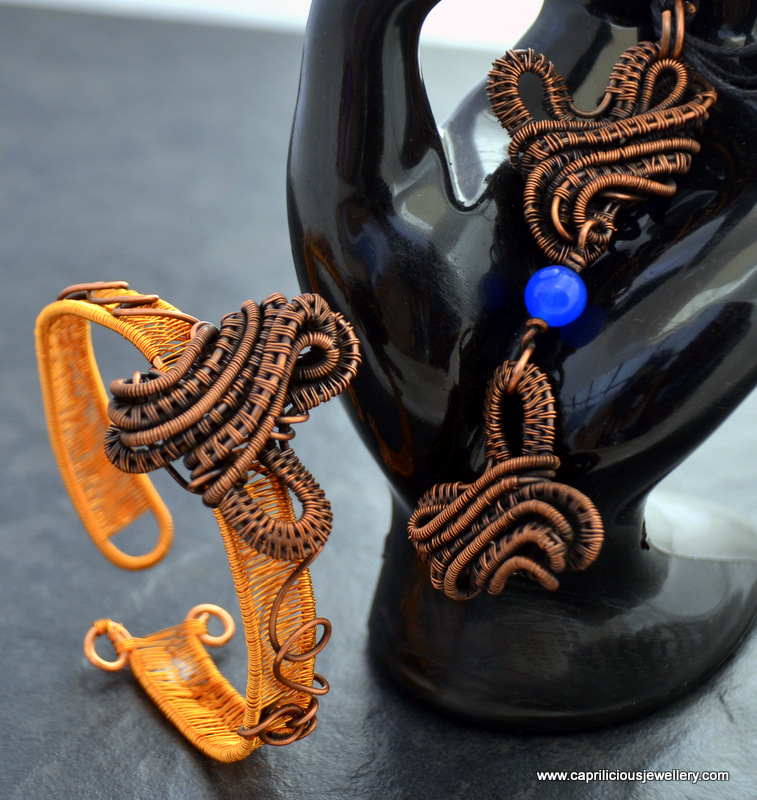 The plain, ugly copper cuff is a thing of the past - I have shaped, patinated, hammered, polished and varnished the bracelets to protect their finish and have added safety chains to prevent them getting accidentally 'left behind' which is painful at the best of times, but heart breaking when you actually love what you are wearing - which you are guaranteed with these pieces. They are inexpensive to buy, so why not stock up to co-ordinate your outfits with your jewellery - or if you like necklaces or earrings to match, let me know. 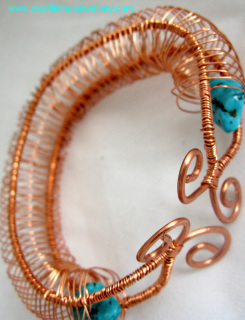 They can also be made in silver or silver plated copper wire if you wish. 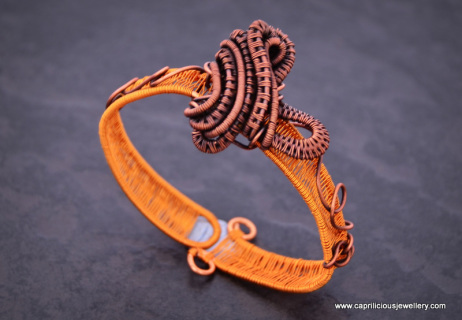 I have put together a gallery, if you like one of the bracelets, scroll down for a fuller explanation of each design and its elements. Turquoise - the earliest known gemstone used for protection from the 'evil eye' - tones and strengthens the entire body; tissue regeneration; aids circulation, lungs,vitalizes blood, enhances meditation; creative expression; brings peace of mind, emotional balance and communication, friendship, and loyalty . Its effect is thought to be enhanced by copper. The bracelet is a half inch in width. The bracelet will go around a 7 1/2 inch wrist easily and has turquoise beads, and is fully adjustable. 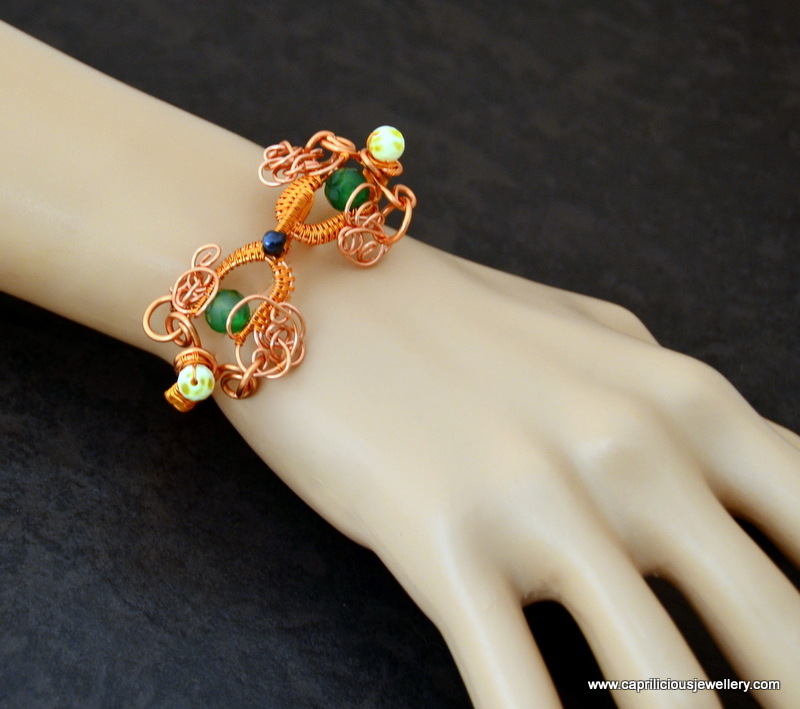 Sweet Swirls - a wire bangle/bracelet in non-tarnish enamelled copper wire, accented with green onyx and creamy agate beads. This one is made to slip onto a 7.5 " more delicate wrist. 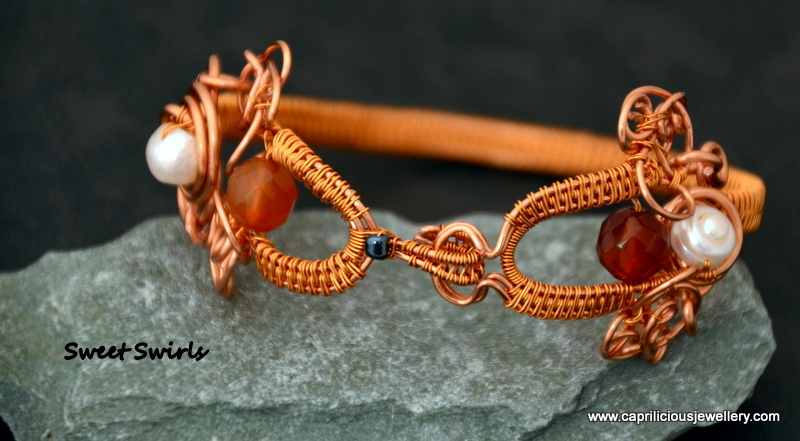 Sweet Swirls - a wire bangle/bracelet in non tarnish enamelled copper wire, accented with carnelian and pearl beads. This one is made to slip onto a 7.5 " - 8.5" wrist and looks delicate while being surprisingly robust. A 3" long pendant made of two antiqued hearts connected to one another with a lapis lazuli bead. 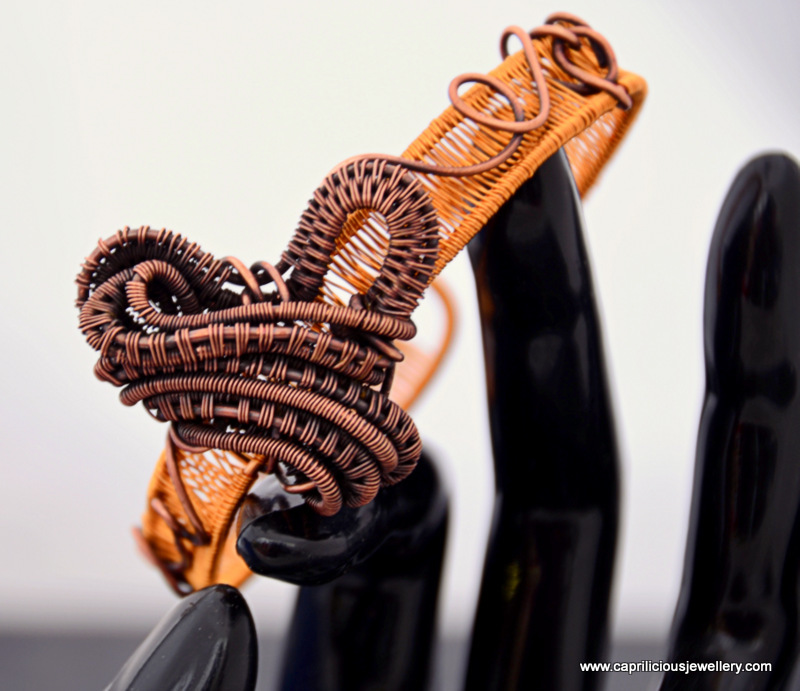 The pendant hangs from a black organza necklace and goes with the bracelet - the bracelet is made of non tarnish copper wire and an antiqued heart and curliques and will fit a 7" wrist, and is fully adjustable. 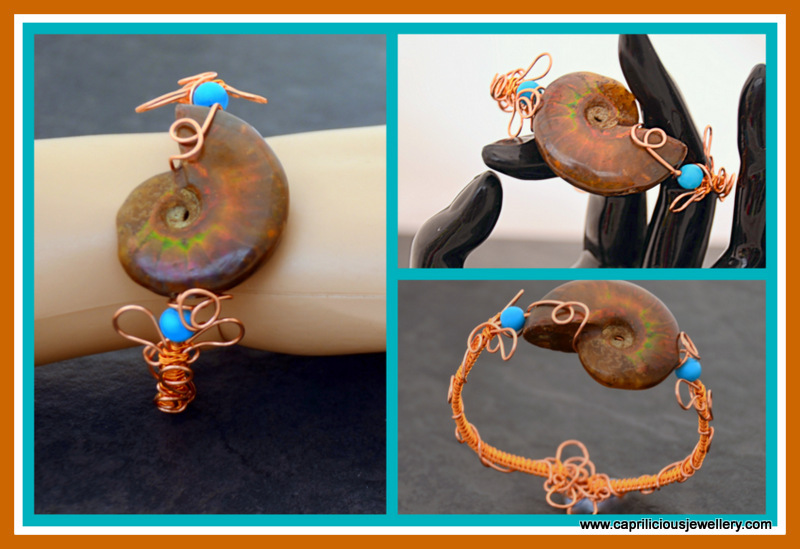 A fully adjustable copper bracelet with an open, lacy scrolling wirework design, with a focal ammonite, flashing with internal fire and flanked by two turquoise beads. The bracelet will accept a wrist from upwards of 7.5" and can easily be stretched to another inch and a half. The wire is non tarnish and will not turn your wrist green! !